Meredith Taylor is offering a voice for students in the midst of the University of Cincinnati (UC) College of Medicine’s reaccreditation process. The third-year medical student is one of a dozen students who serve on six subcommittees at the college tasked with working with the Liaison Committee on Medical Education (LCME) to collect and review comprehensive data on the university’s medical school as part of an institutional self-study. LCME is the official accrediting body for medical schools in the United States and Canada. “Each subcommittee addresses a different area that is going to be observed or will undergo the process of being reviewed,” says Taylor, who is focusing on student education and policies that address mistreatment of students. Her subcommittee broadly looks at academic and learning environments, led by Michael Archdeacon, MD, chair of the Department of Orthopaedic Surgery. “The subcommittee writes up its findings and then we make suggestions or comments based on whether we feel the questions being asked of the school are being answered and whether what is said is true and supported by student observation based on what we actually see day-to-day at the college,” says Taylor. “It’s a lot more involved than I ever knew or understood,” says Taylor. “I think we really do a good job at UC and I’ve had a great experience at the college thus far. Getting to see everything that goes on behind the scenes like what is actually in place to make my education and experience in the clinic and classroom a really good and positive experience, has been eye-opening. “It’s a lot of work handled by many people I have not met, but who make my day-to-day experience the best that it can be,” says Taylor. 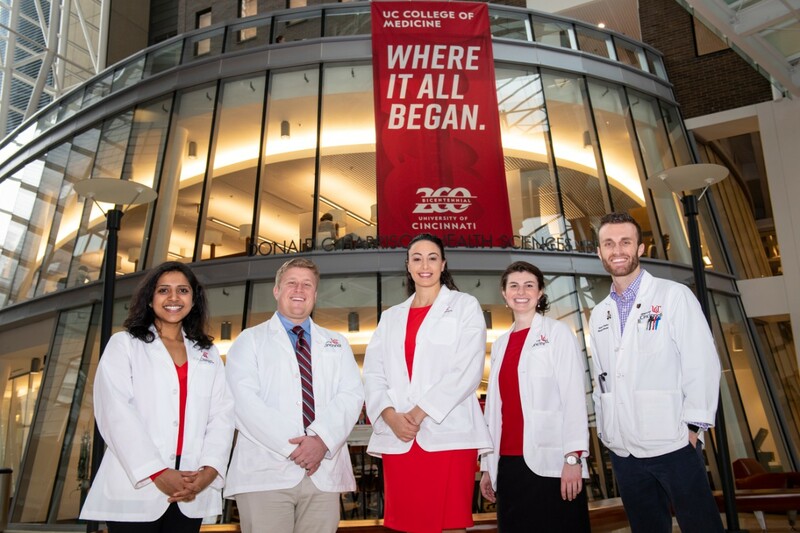 Med students Namratha Kolur, Matthew Hurn, Hagar Elgendy, Meredith Taylor and Robert Daulton are shown in the UC College of Medicine. They are among the students who serve on LCME subcommittees. The self-study is approximately an 18-month process which will help the College of Medicine identify strengths, challenges and formulate improvements for the medical education program. The process will result in a 35-page self-study summary report prepared for LCME as well as data collection and appendices. The self-study process will culminate with an on-site visit/review by the LCME site survey team Oct. 20-23, 2019. A taskforce is in place to move the college through the reaccreditation process. Individual members of that taskforce chair the six subcommittees. Each subcommittee consists of 13 to 15 faculty, staff and students charged with reviewing a host of topics ranging from curricular objectives, design and content to student patient safety, medical student selection, academic support, career advising and health services. A comprehensive list of topics under review is available online. Hagar Elgendy, a second-year medical student, serves on a subcommittee tasked with reviewing the College of Medicine’s mission, organization, leadership and administration, faculty preparation, policies and productivity participation. That subcommittee is led by Michael Lieberman, PhD, chair of the Department of Molecular Genetics, Biochemistry and Microbiology. Elgendy says she hopes her experience as a medical student who also is parenting three children under the age of 3 might be beneficial as UC reviews its policies on parental leave. “I hope I can be instrumental in helping to inform the development of policies that will be helpful in the future for parents attending medical school,” says Elgendy. “Anything, we can do help students who are parenting feel like they are supported academically, socially and otherwise will make me happy and feel like my purpose added value to our process,” says Elgendy. Matthew Hurn, a first-year medical student, says one area of interest for him is reviewing procedures and policies that allow students to access health benefits at the university. Student feedback in surveys included concerns about insurance policies and time constraints that limit access to health care. He serves on a subcommittee that also reviews medical student selection, assignment and progress along with medical student health services, academic support, career advising and financial aid services. That committee is led by Andrew Friedrich, MD, chair of the Department of Anesthesiology. “We are looking at a lot of changes in how we can improve access to health care,” says Hurn.